We are fully qualified, fully insured, health and safety compliant commercial decorators with experience of working with small and large businesses. We are trained to operate boom and scissor lifts in order to comply with working height safety regulations. Based in the Midlands, we work throughout the UK and have many commercial clients. Contact John for your free, no obligation quote. The price quoted is the price you pay. "We found JC Decorators on the internet and met with them for the first time on site to enable John to provide a quote. Our refurbishment contract needed to be completed to a tight deadline, and the contractor needed to be able to work with numerous other trades on site. We awarded the contract to JC Decorators. From the first day through to completion, John and his team were professional in their approach and worked diligently. They worked well alongside the other trades, helping to create a good atmosphere on site, which produced comments from our client as to what a great bunch of guys they were. I could not fault any of their work and was impressed with their knowledge and experience in all aspects of the decorating works. We will have no hesitation in using John and his team on future projects, as we have found skilful professional tradesmen. YES anyone can paint (badly). John and his team do it professionally and have great pride in their work. " 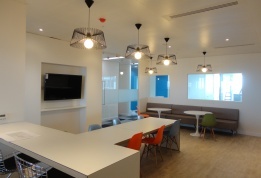 "I have just recently completed a high end CAT B office refurbishment in Birmingham. JC decorators completed the works in a timely and professional manner. The team was friendly and accommodating. I wouldn't hesitate to have them work for me again." "JC Decorators have recently completed a major internal decoration program at our offices. The work carried out was completed on time and in accordance with the agreed specification. First class." "We have had JC Decorators twice to do some work for us and on both occasions I have found their work extremely good. They always work with great care and tidiness and nothing is too much trouble for them. I would highly recommend them to any of my colleagues."